While PowerShell v2.0 has a wealth of new features it is NOT supported in a production environment. Technically it is not even an alpha product yet and things can change. You won’t waste any time learning PowerShell v1.0 as basic concepts and core cmdlets don’t really change. PowerShell v2.0 simply adds a lot of new stuff to the mix. I downloaded and installed Microsoftâ€™s PowerShell. I found it quit intreasting and useful. It gives a UNIX flavour. PowerShell would make Windows more appealing to UNIX systems administrators. Jeffery, I learned PowerShell with v1.0 but I decided to use 2.0 for the extra functionality it provided. While its not meant for use in a production environment, I’m using it in one with caution. I hope that Microsoft will create a version of PowerShell that runs in Windows 2000 since I’m administering one server which could use the better scripting. I needed to make sure your readers didn’t get the impression that Microsoft was offering them a version choice, because they really aren’t. Personally, I wouldn’t take the risk of run pre-pre release software in a production environment. 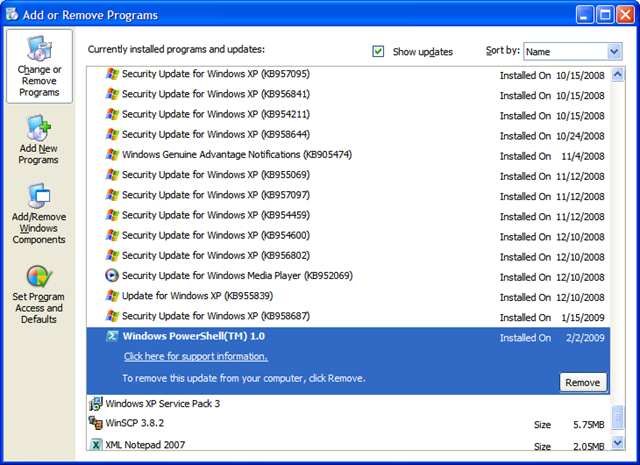 And unfortunately, I doubt you will ever see a version of PowerShell supported on Windows 2000, at least not from Microsoft. The features they are adding just can’t be retrofitted to Windows 2000. They have plenty of work just getting PowerShell v2 features to run on Windows XP and Windows 2003. PowerShell would be great to replace all of the batch files I’m using on the Windows 2000 site, but I could also write simple apps in C# to do the same thing. A great addition to PowerShell would be to have a choice to use any .NET language for scripting. I found examples in C# using Add-Type, but couldn’t get them to work.